Evaluation: Combo guard with a confident approach and tremendous understanding of how to pick apart a defense. Hairston is a good ballhandler that is deceptive with the ball and able to create space to get into the lane. His best attribute is his passing skills where he shows the unique ability to make his teammates better by sharing the ball. He’s a capable scorer that can shoot if he’s left open with time and can finish around the rim in transition. Very solid on-ball defender who despite not having great quickness really competes on that end of the floor. Bottom Line: Nice prospect because of his natural feel for offensive flow. Hairston’s size and versatile skill set should make him a solid college prospect down the road. Will have to continue to develop as a scorer and an athlete but the tools are there to be a good player. 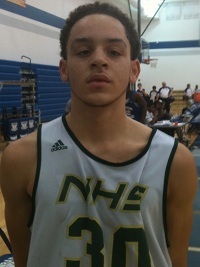 With the departure of ’12 PG Jordan Potts it will be interesting to see what position Northland coaches put him at next year, his sophomore season he started at SG.